Microsoft recently tapped lightly on the pause button on the rollout of Windows 10 Creators update, recommending that users don’t manually install the update if they want to avoid running into issues that might be identified by automatic upgraders. The company hasn’t hit the pause button on the Windows Insider program, however, as evidenced by the release of another Windows 10 preview build. The next major Windows 10 update is currently code-named Redstone 3, and that’s the update Microsoft is working toward with the release of Windows 10 Insider preview build 16184. While most of the Redstone 3 builds so far have been focused more on the core operating system, this one actually introduces a meaningful new feature. We should say that build 16184 reintroduces a feature because this one was supposed to have been included in Creators Update but didn’t quite make it. We’re referring to the My People feature, which greatly enhances how Windows 10 manages contacts and communications, making it more collaborative along the way. Today’s build provides the first glimpse at My People. Users can pin up to three contacts — for now, with the ability to pin more contacts coming in future builds — to the taskbar, making it easy to start communicating without opening an app first. 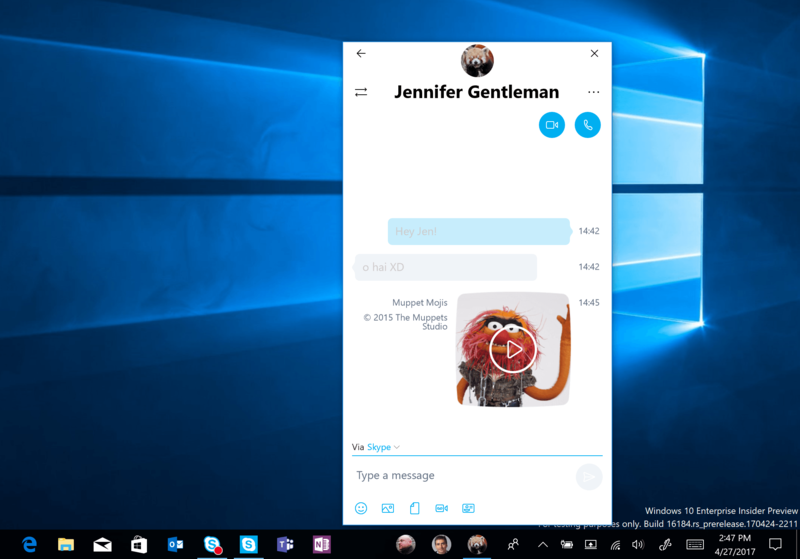 The feature defaults to Skype, but you can choose your preferred app and Windows 10 will remember your choice for later. In addition, users can view multiple communications apps in the same place, filtered by contact. To set My People in build 16184, go to the Windows Store app and make sure that the Skype, Mail, and People apps are updated. Then, click on the People icon in the taskbar, activate the initial setup experience, and get things configured. In the latest versions of Skype, 11.13 or later, contact syncing is on by default, and if you’re using an older version then you’ll need to turn it on yourself. Microsoft also reminded us that Windows Insiders will be getting enhanced Gmail account support in the Windows 10 Mail & Calendar app. If you’re a Windows Insider and haven’t yet received the notification to update your accounts settings to access the Focused Inbox support and other new features, then keep your eyes open for it. The night light feature will no longer get stuck in a disabled state. Dragging an app from the Start menu’s All apps list onto the app grid will no longer cause a crash. The Notification Settings page will now load up more quickly. If your audio system includes features like “Dolby Digital Live” or “DTS Connect,” then these features will work again. The Photos app should no longer crash if you open a picture from the Collection page and then hit the back button. If you see the error “Some updates were canceled. We’ll keep trying in case new updates become available,” then check out this forum post to learn more. You’ll need to right-click on the Windows Defender icon to open the app, rather than double-clicking on the icon. If you have an SD card inserted in your Surface 3, then you’ll need to remove it in order to update to new builds. Microsoft also provided an update on some of the most recent changes to the Windows Insider program and team, including providing an overview of how the program works. If you’ve wondered who makes up Microsoft’s internal Windows Insider team, then you’ll want to check out the post. As always, you’ll need to be a Windows Insider and enrolled in the Fast Ring to get today’s update. You can sign up here, and note that if you’re just starting out, it might take 24 hours or so before you’re offered the update. If you’re already signed up and ready to go, then go to All settings in the Action Center, then Update & security, then hit the Check for updates button.